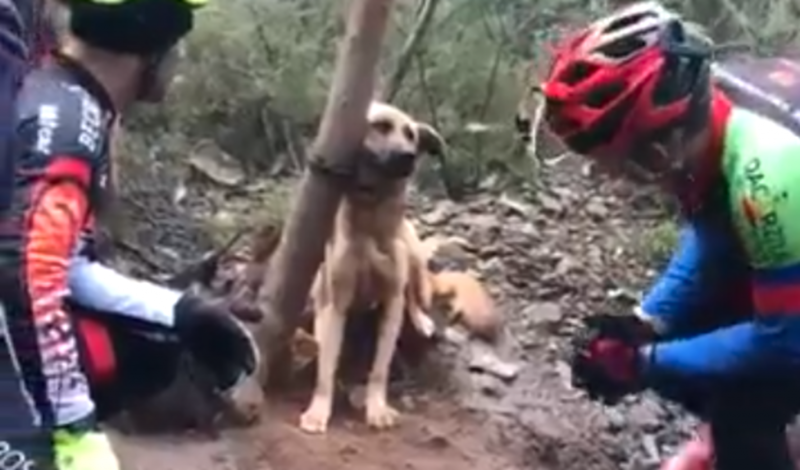 Some cyclists in Portugal were biking through a forest when they came across a starving dog tied tightly to a tree. The poor dog could hardly even move her head, and she hadn’t eaten in so long that her ribs were showing. It was obvious that whoever abandoned this dog didn’t want anyone to find her. But these heroes found her just in time. They slowly approached and offered food and tried to gently pet her to gain her trust. As the dog ate, the one cyclist worked to cut her free. Thankful for the rescue, the starving pup was taken to an animal rescue where she will be put up for adoption once she’s back in good health. No one knows who did this or why, but it’s a miracle these cyclists happened to find her that day.